A couple weeks ago I wrote an article about second chances, because I really do believe we all deserve them. And then I got to thinking that there’s another important piece to this that I didn’t mention. Sure, when we’re too hard on ourselves, critical of our lack of progress, or forget to acknowledge how far we’ve come, we’re doing ourselves a great disservice. We are magical beings with multi-faceted personalities and life experiences – each of them more valuable than the next in creating the person we are and how we show up in the world. The part I didn’t mention before is that we also do ourselves a disservice when we don’t hold ourselves to the standards we’ve set, when we don’t keep our word, and when we don’t do the things we’ve set out to do. What I’m talking about here is discipline. discipline is the thing that actually moves us forward. I used to have a great aversion to discipline; I thought that being disciplined cut off my options and held me back. 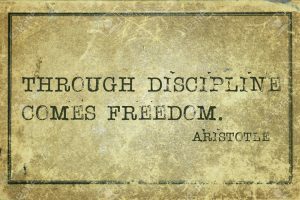 In a sense I felt that discipline would take away my freedom because I couldn’t ‘wing it’ with my time. And then I started to take note of the people I knew personally and successful people in the public spotlight who disciplined and held themselves accountable. They set high standards, made schedules and plans, and then stuck to them – no matter what. Some of them did things like exercise or meditate every single day, arrive to work at a specific hour, made extensive to-do lists with hard deadlines, had the difficult conversations, and maintained strict healthy diets – not even taking a bite of ice cream or chocolate cake or having a beer or two. Some of it seemed extreme to me. And then, when I looked closely, I could see that most of them were pretty darn happy, content, and often successful in their chosen work and relationships – and this was while they were disciplined in a way that I thought would ‘cramp my style’. And so I decided that they were on to something that was working for them and it was worth a try for me too. I’ve created my own disciplines in the areas of physical health, business, and emotional well-being. I am my own watchdog, accountability partner, and cheerleader. It hasn’t been easy for me and I know I have a long way to go, and as they say in Texas “it’s not my first rodeo”. I’ve done this before; I’ve started many times to create habits and disciplines that I knew would serve me, and all too often I didn’t stick with them. I’ve let myself down and then I’ve picked myself up more times than I can count. And yet here I am giving myself a second chance and creating new disciplines – maybe for the 49th time – and that’s OK with me. The important thing is that I keep on keepin’ on and keep on doing it – even if it doesn’t last. I know I am a better person for having started, tried, succeeding at times, and yes, even for failing. In my failure I always learn something about myself. Perhaps the most important thing I’ve learned is that creating a habit and being disciplined isn’t easy, but I do know it’s worth it. Because the person I have become and continue to evolve into is richer, deeper, lighter, happier, and more connected to the stream of well-being that is my birthright. This same stream of well-being is your birthright too! And so I will continue to create disciplines – undoubtedly failing sometimes, and yet succeeding more often than I fail – so I can continue to grow and morph into the best version of myself I can muster. If this is your wish for yourself too, then set some high standards, get started now, and go for it! I’ll be rooting for you. Please root for me too! Would you like more inspiration like this? Sign up for Sue’s Feel Good Webinar! The ability to stay current and valid is a skill – it’s what helps us breathe. I would love to get your insight on this living topic.